How are you going to stay relevant in this rapidly changing industry? Category management practitioners, executives and solution providers all need plans to move to more advanced catman approaches to reflect changing data, technology and Shopper. As an experienced category management professional in Retail, Manufacturing or as a Solution Provider, you’ll need concrete ways to reflect the changes that have happened over the past 30 years. A Practitioner - someone who does day-to-day work that stems from some or all parts of category management. Master the areas you can influence and make changes within (for your role, team and/or organization). Inclusion of Internal alignment. Your multi-functional team (including marketing, sales, category management, retail operations) aligned to a category management approach. Injecting Shopper Insights in advanced category assessments. In the past, we’ve done a good job understanding the “what”, but we were missing the “why”. Adding Shopper Marketing as a new tactic. Find the best ways to incorporate Shopper Marketing into the total category plan. Category Definition and Segmentation, utilizing well-researched category decision trees to reflect what’s most important to the Shopper. Category decision trees set the stage for the rest of the category management process, affecting the data, the analytics and the tactics. Category Role Assignments, incorporating Shopper-focused metrics into category role assignments. Retailers and manufacturers need to think beyond category size / importance to reflect Shopper behavior when assigning category roles. Category Strategies, which once again need to reflect the Shopper, understanding their emotional needs and considerations to create unique strategies for the Retailer. From an educational perspective, we all need to be aware of these changes in the catman foundations, as we need to reflect these changes in the day-to-day work that we do. From a more strategic perspective, executives / influencers have an opportunity to define overall corporate strategies to reflect a more advanced category management approach for their business. This will help set new guidelines and strategies for category management, and will also help create internal alignment identified above as part of #1 above. The latest data sources and technologies, with focus not only on the newest measures and reports, but how to incorporate them into reviews and assessments for better opportunity identification. Methods to develop (more complex) best-in-class category reviews / assessments that follow a corporate approach for improved alignment and internal efficiencies. Inclusion of Shopper insights to identify “why” they buy (as per CatMan 2.0™ from the CMA). Shopper has been missing from most category assessments and needs to be better reflected as the focal point in advanced category reviews and assessments. There are some ways that, as practitioners, we can make changes at our desk to better reflect Shopper in our category analytics, assessments and reviews which can be taught through advanced learning. But there are also some changes that executives / influencers need to make to allow practitioners to foster some bigger changes within their team and organization. Developing best-in-class reviews and processes that harness all of the data sources and technologies, consider future trends and predictive analytics and reflect the Shopper will result in better outputs and recommendations to drive business results, increase ROI on the data & technology investment, and will also improve efficiencies and alignment for the organization. Product Assortment. Listings/Delistings. Distribution opportunities. Store cluster / store specific assortments. Shopper-focused category decision trees. Space Management. Shelf space optimization. Category adjacencies. Shelf layouts. Store cluster / store specific planograms. Shopper-focused category decision trees. Price optimization. Price elasticities. Shopper expectations and value perceptions. Promotional pricing. Promotional planning. Shopper-based promotional analysis. Trade marketing. Payout. As practitioners, there are some educational opportunities for each of the tactics above on more advanced analytics, data sources and technologies available. Learning can be applied in the work that you do, and to derive insight into what’s going on in the industry and continued changes to each tactic based on new developments. For executives and influencers, there’s a need to modify standards and best practices to reflect the changes in each tactic. The addition of Shopper Marketing as the newest tactic is a major change – how will you start to incorporate Shopper Marketing as part of the overall category plan? Identify better ways to measure return on investment (ROI) on category management investments now and in the future. While practitioners may want some perspective on the educational components that relate to these more strategic areas, executives and influencers will most likely need to spend a lot of time and consideration in many of these areas. The deployment step in the original category management process lacked depth in identifying some of the obstacles related to execution at the store shelf. Both category management practitioners and executives need to understand not only the biggest challenges and opportunities in deployment of category plans to improve store level compliance, but they also need to start to make the connection between category management and supply chain for a truly holistic approach. 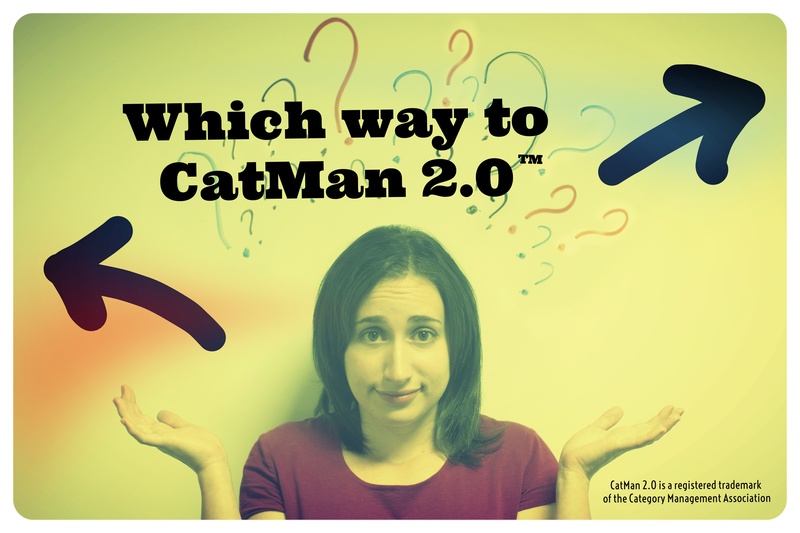 In summary, all of the changes captured above reflect the new and improved approaches to category management based on CatMan 2.0™ (developed by the CMA). What YOU do next depends on your category management role and the work that you do. Category Management is my passion. Since beginning with P&G in the late 1980s, I have dedicated my work life to building and sharing this passion with others through active involvement in the industry, including long-term business relationships with large Retailer and Vendor executives, development and influence on Category Management Association certification standards and curriculum, thought leadership publishing and presentations at CSP News’ Convenience University, CMA’s Annual Conference and LinkedIn, and as a member of DePaul University’s Center for Sales Leadership Advisory Board. Through this blog and other channels, I share this expertise and believe that an open and ongoing conversation can improve any team’s capacity to implement business strategies that achieve their strategic priorities.